Keelan Berg recently had a stellar performance at the Baddest Blue tournament which found Berg showcasing his great talents against some of the top blue belts in Southern California. He is a blue belt under D.Davis and trains out of Primal Jiu-Jitsu in San Diego. To Keep his competitive spirit going he trains a lot, teaches the kids class and competes every chance he gets. Care to share with readers about yourself and your BJJ background? Keelan Berg: I started wrestling in high school because I was tired of getting beaten up by my two brothers. My younger brother is a big guy so I needed a head start. At the same time, my older brother started BJJ and he soon was able to take us both. I found D. Davis at Primal Jiu Jitsu and my skills developed quick, at least between my family rivals. I’m not the kind of student that wants to jump around to a bunch of different schools and I have never trained anywhere but Primal. BJJ has developed into a lifestyle for me and I have learned much more about myself. How has being a participant in BJJ impacted your life? Keelan Berg: It really revs up your mind and imagination. Like the other day I was standing in line for lunch and realized I could choke and armbar everyone in the line if I wanted to. But on the serious side, it really has made me focus more at school- my grades have gone up and I am way more confident taking on the challenges of starting a life for myself. I also have learned to not sweat the small stuff and as long as I work hard and make decisions based on my heart that everything will eventually fall into its proper place. The greatest thing I’ve learned is that it takes time to become an expert at something. So many people today think that everything should come them quick, but BJJ has taught me to slow down and enjoy the experience of learning step-by-step. Being a participant everyone wants to make the best of their experience. Making the step to competing what were your reasons for wanting to become a competitor? Keelan Berg: I kind of treat every roll like a competition, so I feel it was a natural progression for me. I constantly want to test my skills and always enjoy a tough match. There’s only so much you can learn in the classroom bubble, and I feel it’s important to put your heart on the line. The only downfall of competing is if you have regret that you didn’t put enough on the line, and if you do that, then there really is nothing to lose. How would you define yourself as a competitor? Keelan Berg: I definitely try to be aggressive and continuously search for an armbar. I don’t like to defend a submission until the very last minute. I like to use offense and constant movement as my defense. I don’t know if it’s the best strategy, but I just love the feeling of getting a submission. What are some of the benefits you gained through competing? Keelan Berg: Girls, money, and fame. Yeah right, at least not yet. Primarily, I think it’s the best tool to see if my game is progressing or regressing. If I’m not seeing progressively better results in competition then I have to go back through my basics and see where I can improve. One of the most beneficial aspects has been the mental toughness that is gained through competition. It really is scary stepping out there to fight someone I don’t know, but when it’s over I realize that it’s not that big of a deal. I’m starting to learn that this mental toughness can be used in all aspects of my life, not just on the mats. Now just recently you competed in a grueling tough tournament known as the Dream Jiujitu’s Baddest Blue tournament. How the overall experience was and how does a competitor such as yourself deal with the shortcoming of a lost? Keelan Berg: The 40-minute semi-final match showed me that I can overcome adversity one minute at a time, and it was the toughest match I’ve had. I think the emotion of that match really took it out of me, and next time I’ll need to be prepared for the mental stress that a long match can put on you. As for the loss, I am focusing and preparing on arm barring the Baddest Blue winner at a future tournament. It’s tough because I had beaten him a few months ago in a point tournament, but I’m sure we will be seeing each other for many years to come. Looking onward what do you see for yourself in future in this sport? Keelan Berg: I’m a fairly new blue belt, so right now I’m focusing on winning the major IBJFF tournaments at blue. Also, I teach the kids class and hope that my knowledge gained through competing can be passed on to the little guys and girls. I try not to focus on things too far in the future because it is a little daunting. I just want to make a solid foundation for myself so I don’t develop any bad habits that will hamper me at the higher levels. Any closing remarks before we close this interview? Keelan Berg: Thank you Monta Wiley and bjjlegends.com for the chance to tell others about Primal Jiu Jitsu and myself. 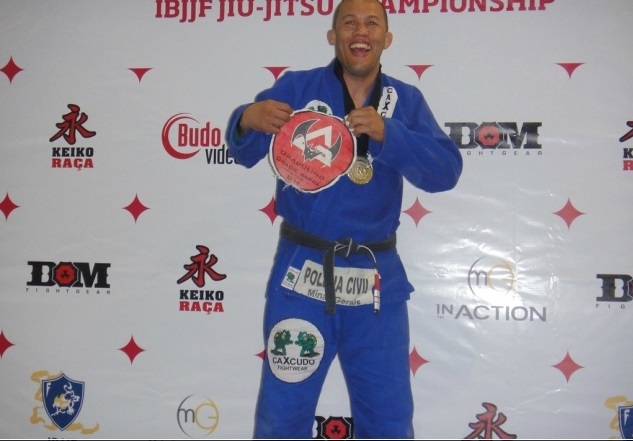 We are a fairly new school and it’s always great to see how BJJ is expanding. Special thanks: To Professor D. Davis, Coach Craig, and my teammates for all the motivation, instruction and friendship. Also, to my two brothers for constantly trying to prove that they were tougher than me.